The working of this voltage doubler, the capacitor C1 charges during the negative half-cycle of the input voltage it charges through the rectifier CR1 and it will reach a voltage of VM during the positive half cycle the input voltage will be in series with the voltage of C1. 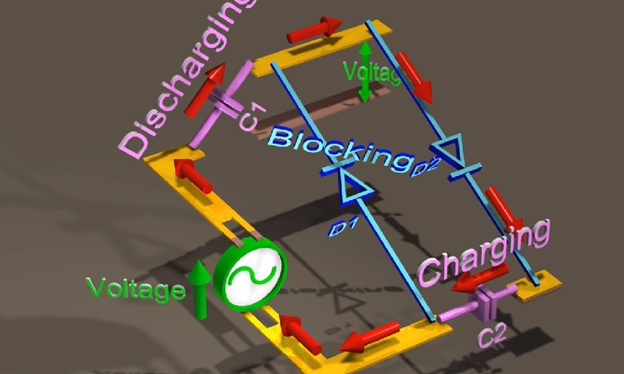 Then capacitor C2 will charge through rectifier CR2 and its voltage level will be 2vm. Capacitor C1 helps the charging of capacitor C2, capacitor C1 sees the alternating current while C2 sees only direct current in this the output voltage and the input signal has the same ripple frequency. Most of the multiplier circuits have rectifiers and capacitors the operating principle of the multiplier circuit is mostly the same. Capacitors are charged and discharged during the alternate half cycles of the supplied voltage additional capacitor and rectifier does the voltage increment across the capacitor which is in series the output voltage is the sum of these series capacitor voltages. We can create voltage tripler by adding single diode-capacitor to the half wave doubler circuit the output voltage will be three times than the input it has one and a half voltage doubler stages depending upon the direction of the input half cycle the diodes will block the charge and discharge of the capacitors.